Used for registration of single or multiple tickets for Children 5 years- below 12years. 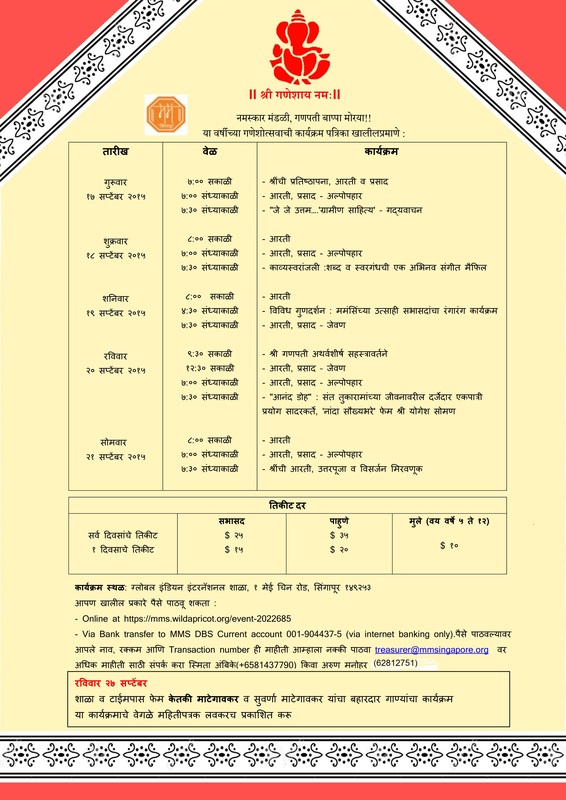 All programs in Ganeshotsav during 17 Sept to 21 Sept.
All children registered in this category must be below 12 years age. If more than one child ticket is requested, add their names as "Guests" . The total ticket charges shall be payable by the first person as indicated by the email address in this application. All programs in Ganesh utsav during 17 Sept to 21 Sept. Registration for MMS single or multiple members. All persons registered in this category must have paid annual fee 2015. If more than one MMS member is registering, add their names as "Guests" The User First Name, User Last Name and email address of all the registered persons must be same as registered for MMS. membership. Used for registration of single or multiple tickets for non members. Multiple persons can be added by using "Add Guest" in the registration form. If more than one person is registering, add their names as "Guests"
Used for registration of single or multiple MMS members, only for one day between 17th to 21st Sept.
All persons registered for this ticket must be 2015 annual fee paid MMS members. Indicate the date of the Ganeshotsav for which the ticket is requested. Used for registration of single or multiple non members, only for one day between 17th to 21st Sept. Indicate the date of the Ganeshotsav for which the ticket is requested. The total ticket fees shall be payable by the person registered as the first person under this category. येणार येणार म्हणताना आपल्या लाडक्या आराध्यदैवताचा, श्री गणरायांचा उत्सव अगदी जवळ येऊन ठेपला आहे! आमच्या बाजूने विविध कार्यक्रमांची तयारी, भारतातून येणाऱ्या कलाकारांची सोय, इतर साहित्याची उजळणी-जुळवाजुळव, जहिरातदारांशी चर्चा, स्मरणिकेचे आरेखन ही कामं सुरु आहेतच; त्याचबरोबर आपल्या सदैव उत्साही सभासदांची कार्यक्रमाची तालीम आता अंतिम टप्प्यात पोहोचली आहे. स्वयंसेवकांचीही नावं यायला लागली आहेत. आपले, सढळ हस्ते मदत करणारे प्रसाद प्रायोजक व देणगीदारही नावे नोंदवत आहेत. श्रीगणेशोत्सव २०१५ ची कार्यक्रमपत्रिका इथे जोडली आहे. आपल्या दर्जेदार कार्यक्रमांची माहिती घ्या आणि आपली तिकीटे लवकरात लवकर आरक्षित करा. तिकिटांच्या अधिक माहितीसाठी संपर्क करा स्मिता अंबिके ८१४३७७९० / अरुण मनोहर ९३९१४१५०. स्वयंसवेक म्हणून नाव नोंदवण्यासाठी संपर्क करा अस्मिता तडवळकर ८१६८६१४२. गणपती बाप्पा मोरया! मंगलमुर्ती मोरया!! 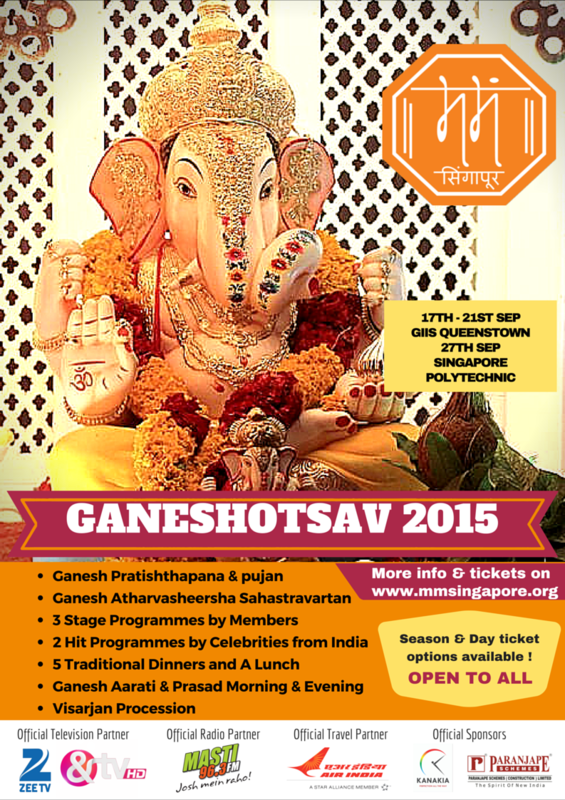 The festival that brings enthusiasm and nostalgia to all of us - the Ganesh Festival - is just around the corner. Each year all of us celebrate it with a lot of festivity and fervour at Maharashtra Mandal (Singapore). This year too, MMS has planned 5 days of cultural fest for you. The members and committee are preparing hard on all fronts to make it a memorable Ganeshotsav. Hope you like the art and culture treat we have brought for you this year. 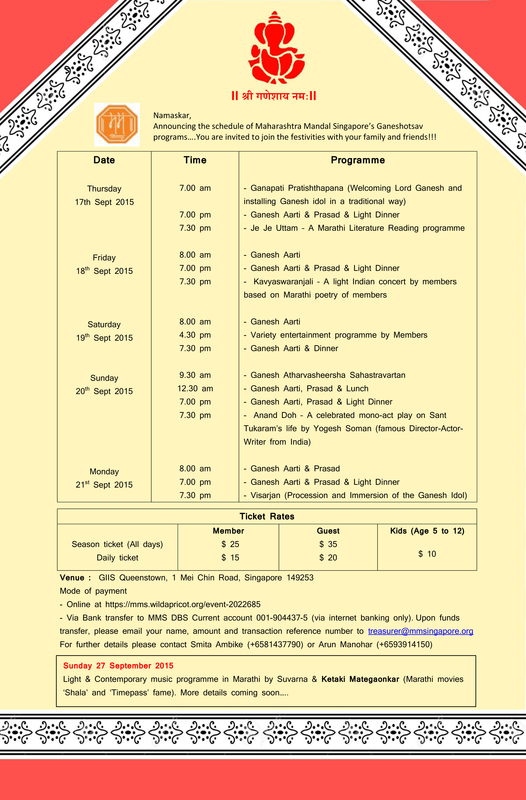 Please book your season tickets that give you entry to 4 quality programmes and 6 lunches/dinners/snacks (& not to forget Ganapati prasad every morning and evening). There are options of buying daily tickets as well. Both members and non-members are welcome (ticket rates differ). Please do book in advance to help us with our logistics. If you need any assistance with ticket bookings, please reach Smita Ambike 81437790 or Arun Manohar 93914150. If you wish to help by volunteering your time, please contact Asmita Tadwalkar at 81686142.